Emily B. Baran. Dissent on the Margins: How Soviet Jehovah’s Witnesses Defied Communism and Lived to Preach about It. 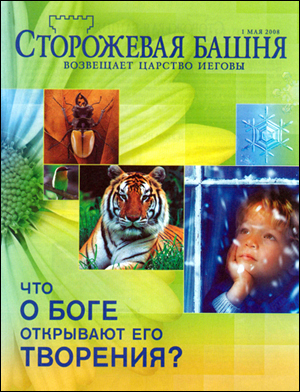 Oxford: Oxford University Press, 2014. Soviet officials tried attacking Witnesses through their children, but the children just fought back. Students would sit through entire movies their teachers tried to show them with their eyes shut. refused to join youth organizations because “the Pioneers do not recognize God,” and one boy openly said to his class that “in order not to be influenced by Satan, I read only the Bible. I do not read any other books. I do not go to the movies. I do not watch television, and I sing only Christian songs.” When these children came of age they preferred to go to prison than to join the army. When it was time to vote, they either avoided voting altogether or they wrote “I vote for Jehovah” on the ballot. One of the most entertaining sections of the book is Baran’s chapter on Soviet attempts to convert Witnesses by preaching at them. It quickly became apparent that most atheist agitators didn’t know what they were talking about, and expected arguments that dead bodies decompose to convince Witnesses not to believe in life after death. Apparently they had never heard that believers receive new bodies at the resurrection! Witnesses responded by attending lectures on atheism and – at great personal risk – asking the speaker questions s/he could not answer, such as “what is a law of nature?” or “can there be a law without a lawgiver?” According to a Soviet article, whereas Witnesses usually made sixty visits to someone before they were converted, atheist agitators gave up after only five or six visits. Baran isn’t writing a hagiography of Witnesses, and she frequently gives details about families split apart when the children abandoned their faith, or people who lied in order to avoid arrest. But the story she tells is overwhelmingly one about dissent in the face of brutal persecution. When the Soviet regime eventually decided to register Jehovah’s Witnesses as an official sect, the Witnesses refused unless the regime would allow them to knock on people’s doors and to avoid military service. Whereas their refusal to accept blood transfusions has caused problems between Witnesses and the state in countless countries, this was rarely an issue in the Soviet Union because the communists just gave patients transfusions by force, without asking their permission. Things improved somewhat after the fall of the Soviet Union in 1991, but still Russian society was overwhelmingly hostile towards Witnesses and slandered them in the press. 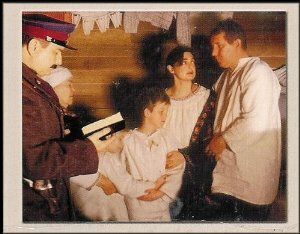 The Russian Constitution of 1993 said that conscientious objectors have the right to do “alternative civil service” instead of joining the army, but no law made this actually possible until 2004 and in the meantime Witnesses were still being sent to prison for avoiding military service. Similarly, in Ukraine the government recognized Jehovah’s Witnesses as a religion, but then published textbooks claiming that they – like Satanists, Scientologists, and Mormons – were “banned” because of their “aggressive” and “light hypnotic methods.” Communist regime or not, it seems that throughout the former Soviet Union people still don’t like people knocking on their doors. Jesus has given the task to his followers to go out in the world and to preach. The last centuries we do not have seen many Christians who really followed up this given task by the master teacher, rabbi Jeshua. 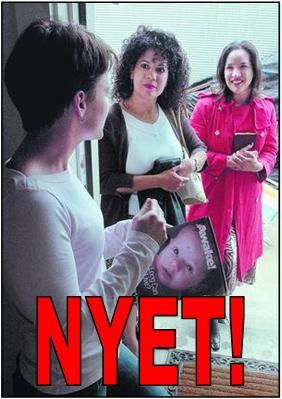 The last half century it were not only Soviet officials who tried attacking Jehovah Witnesses through their children. In many countries in West Europe their children also had to fight back. It is lovely to hear that there are also people who are interested to notate all the effort that was put in such an important task of spreading the Word of God. Emily Baran her countless little vingettes of poor, working class people who believed Charles Taze Russell’s predictions about the end times so strongly that they were willing to suffer losing their jobs and their families, imprisonment, and exile in order to remain loyal to Jehovah’s message, perhaps may inspire others also to start or to continue with bringing the Good News about the coming Kingdom of God .